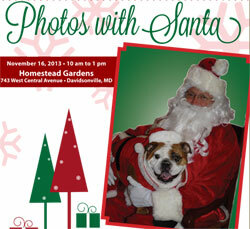 Homestead Gardens in Severna Park, MD and Davidsonville, MD hosted a photo session for pets to have their photos taken with Santa. 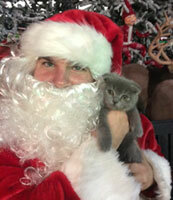 Santa Paws Event – Big Success! 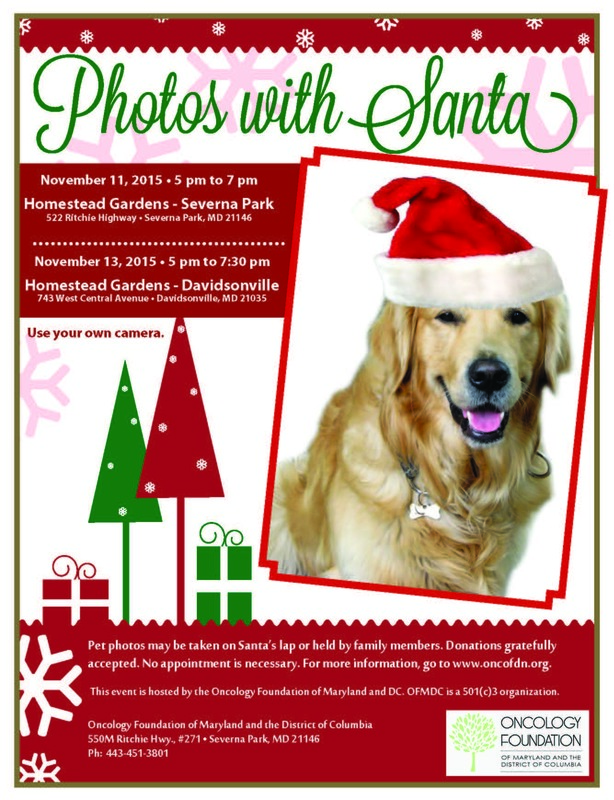 OFMDC raised more than $800 with its 2015 Santa Paws events. 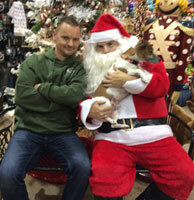 We thank Homestead Gardens for making their lovely stores available to us, as well as helping promote the event to their customers. 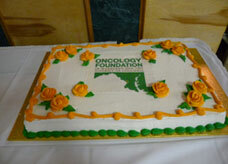 Thank you to all who participated in the November 13 Surviving Cancer Event held at Anne Arundel Medical Center. 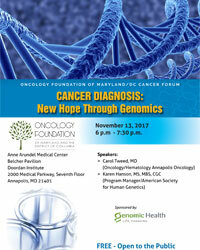 Surviving Cancer is presented by the Oncology Foundation of Maryland and the District of Columbia and hosted by the Anne Arundel Medical Center’s Geaton and JoAnn DeCesaris Cancer Institute . 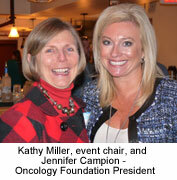 Saturday, April 6, 2013 • 10 a.m. – 1:30 p.m.
What does cancer mean to me? What are the diagnostic and treatment priorities? 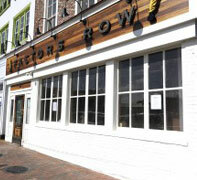 What do I need to know now and where do I find it? Who is going to help me on this journey? How do new clinical options and research offer hope for the future? 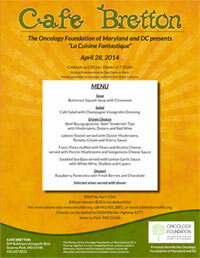 FREE Event Sponsored by the Oncology Foundation of Maryland and the District of Columbia, a 501(c)3 organization. The speakers are donating their time to provide information of vital interest to cancer patients and their families, as well as health conscious individuals. 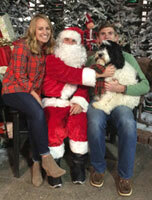 The Silent Auction, held Dec. 10, raised more than $1800 for the Foundation. 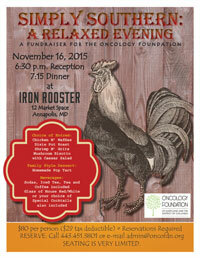 Funds will be used to offset the cost of Cancer Forums and operations. The Foundation is grateful to all who participated, and especially to Auction Chair, Gale Scavone, as well as Susan Nolte, President. 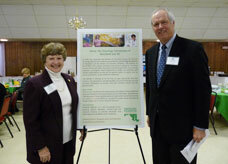 The group sponsored the Anne Arundel Cancer Forum on March 6, 2010. The event, attended by approximately 115 people, provided reliable information on various types of cancer, as well as treatment options. Most of the presenters were practicing oncologists. The event, held at the Severna Park Elks Lodge, was FREE and open to the public. 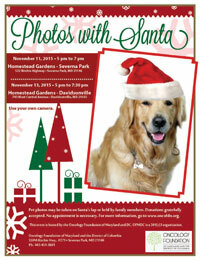 There were also exhibitors from the local cancer care community. 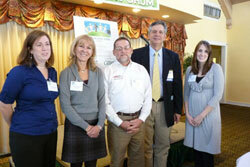 The luncheon speaker was Gary Jobson, world-renowned sailor and cancer survivor.